While Mumbai Indians are seated third on the points table with four wins from seven games, they lost their last match against Rajasthan Royals at the same venue on Saturday. On the other hand, even though RCB is placed last on the table with just one win in seven outings, the fact that they beat KXIP at home on Saturday will surely motivate them further. RCB Team in IPL 2019: Schedule and Squad Analysis of Royal Challengers Bangalore in VIVO Indian Premier League 12. Speaking after Saturday's game, while Kohli had mentioned how his players still have the desire to go out and express themselves, Man of the Match AB de Villiers had rung the warning bell for the opposition saying he loves playing at the Wankhede. Not good signs for Rohit Sharma and his boys for sure. 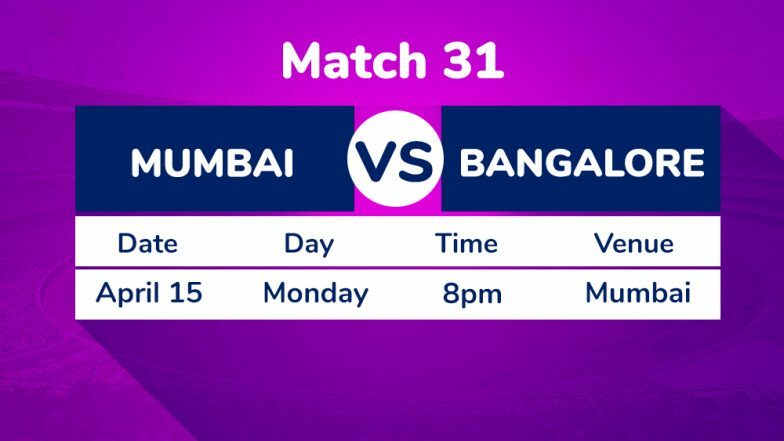 Mumbai Indians Squad in IPL 2019: Team Profile, Schedule of MI in VIVO Indian Premier League 12.